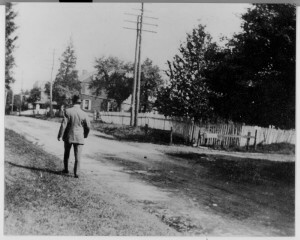 A man walks along Rt. 340 in the area that will someday be Lynwood Road. The first fire hall would be built near the utility poles in 1922. 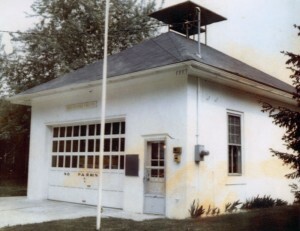 By 1921 the Fire Company members were ready to build their first fire hall. They purchased land west of the railroad along the south side of Old Philadelphia Pike from Benjamin Wilson and by February 7, 1922, they moved into their new building. Dave and Mary Haldeman, long-time fireman and Ladies Auxiliary member, shared these memories of the interior of this fire hall. For a number of years we only had one big room where we stored the engine and cooked and served the benefit dinners. There was a loft, but we did not use it much for storage because it was only a hole in the ceiling and difficult to get to. Because the fire hall only had a cistern, we ran a hose through the west door to a neighboring house and used their water for the dinners. We had space to serve 30-35 people at a time. The windows became fogged over at the ham dinners from all the activity and conversations. A tent was also set up outside to give added space for dinners. According to Dave Haldeman, the fire hall had room for only one firefighting vehicle. Storage for other equipment was mainly the hooks on the walls and the cab of the fire truck. For a short time the firefighters were able to store two vehicles in the room by backing the squad truck in first along the west wall and then backing the fire engine in beside it. 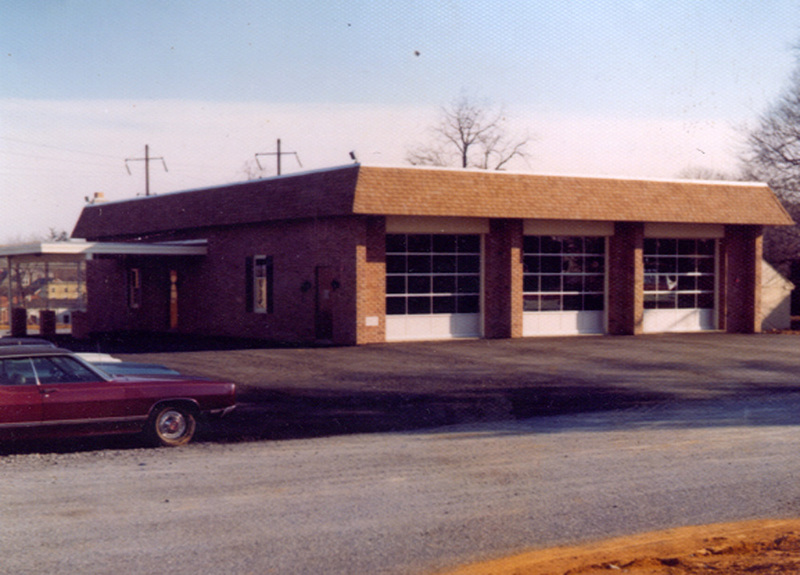 This fire hall served the needs of the Fire Company for the next 50 years. By the 1970’s it was clear that a new building on a larger plot of land was needed to house vehicles and equipment, as well as to provide space for increased fundraising activities. After the Fire Company moved out in 1972, it has been the location of several businesses including Cleveland Brothers and Agri-Analysis. Presently Emily Hoerner operates her business, Every Individual Salon & Massage, in the building owned by her parents Tim and LouAnn Hoerner. 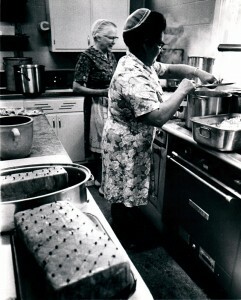 Marian Bare &amp; Mim Landis prepare ham dinner at the original fire hall. Because fundraising efforts were growing, the Fire Company added a kitchen to the back of the fire hall. Paul Yuninger was the builder and the Ladies Auxiliary sold blocks for 15 cents a piece to help pay for the addition. Dave and Mary Haldeman remember that this kitchen and restroom addition helped to relieve congestion at the fundraiser dinners. The dinners were served from a large window that separated the kitchen from the rest of the fire hall. The Fire Company did not have far to search when it was looking for a new site. 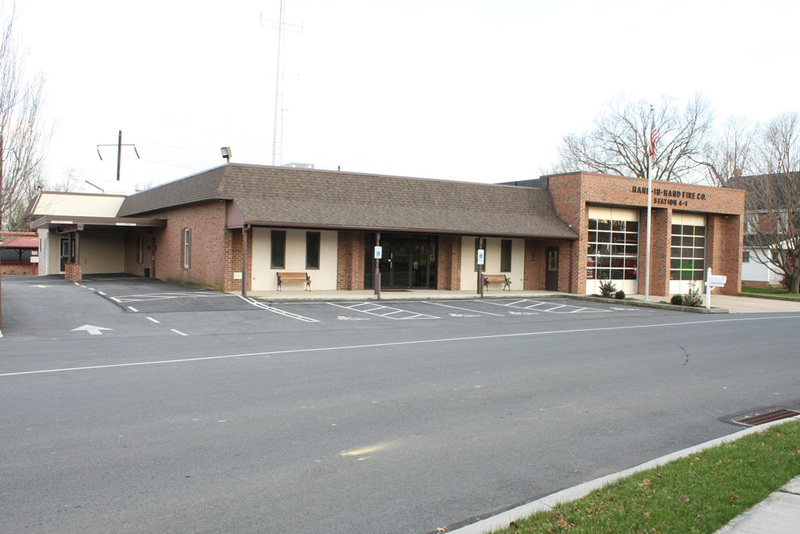 The members were able to acquire property directly across from the old fire hall on the north side of Route 340. They bought a two-unit apartment house at 2653-55 Old Philadelphia Pike. Eber O. Reese donated the land behind the apartment house to the Fire Company in conjunction with his Industrial Realty Company. 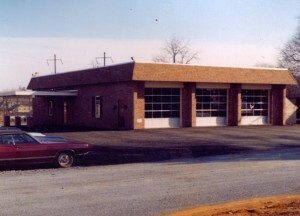 A condition of the donation required the Fire Company to build a new north-south street, which became Enterprise Drive. 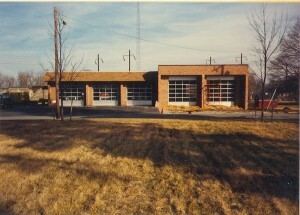 The new fire hall was built on the donated land behind the apartment building. The apartment building was sold to raise funds for the building project. Construction of the new building began on June 15, 1972. Bill Landis was the architect and Emmanuel Flaud Sr. was the general contractor. It truly was a community effort with much donated labor. Elmer Fisher was the foreman directing the work on site. 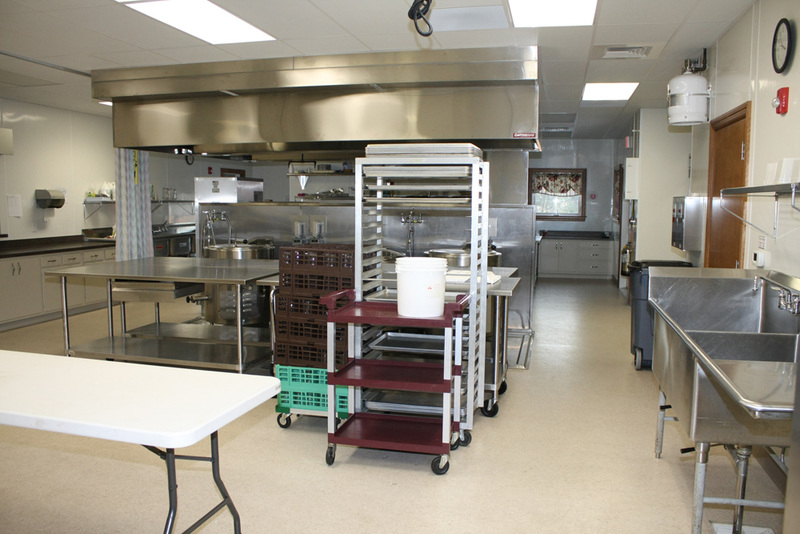 The new building had three vehicle storage bays, a dining room, kitchen, and a partial basement for storage. It cost $62,000 and was dedicated on January 13, 1973. Lack of storage space in the dining room and kitchen became a big problem as the fundraising meals increased. Emmanuel Flaud Jr. was hired to construct a 38’ x 45’ attached utility building. The Fire Company had planned well, but 17 years later, it was again feeling the need for more space and upgrades in its building. Higher and longer firefighting equipment required bigger bays. The members again enlisted the help of architect Bill Landis who designed the addition of an engine room. The general contractor for this building project was Bird-in-Hand Builders who worked through the winter of 1989 and early part of 1990 to construct the addition. The Building Committee was John Petersheim, Levi Stoltzfus, Daniel Fisher, and Raymond Kauffman with Elmer Glick as chairperson. Elmer Glick took his role seriously and gathered stray cement blocks in the trunk and back seat of his car as he traveled to farms with his work. At one point the Fire Company had knocked down a cement block garage that was on the property and given the blocks to John Petersheim. John had taken the time to knock off the cement fragments, thinking they were his. Now the Fire Company took them back to erect the interior walls. The Finance Committee of Lloyd Glick, Dave Beiler, and Tim Hellberg with Harlan Kauffman as chairperson had the challenge of acquiring and managing funds for two major projects at the same time. That year the new Tanker 4-1 cost $190,952 and the Engine Room addition that had room for 4 vehicles was built at a cost of $98,000. On Saturday, May 5, 1990, the Fire Company held the dedication ceremonies for both the new Tanker 4-1 and the Engine Room. First they led off the festivities with a parade of the fire equipment through the village of Bird-in-Hand. Then followed that with a program at the fire hall, which included prayers, John Brubaker III as the guest speaker, America played on trumpet by Oliver Shenk, a litany of dedication, the housing of the tanker, and refreshments. As the Fire Company was approaching its 100th anniversary in the first decade of the 21st century, the main areas of the fire hall were again in need of upgrading and renovation. Improvements were planned for firefighting facilities, fundraising events, and safety requirements. Jake and Ruth Bare had donated additional adjoining land to the Fire Company in 2004 so that the parking lot could be expanded to the west. Thus, the property was large enough for another addition. In order to accomplish all of the building goals in a financially responsible way, the Building and Finance Committees broke the project into two phases. Phase I was designed by Providence Engineering and constructed in 2008 by D & M Builders at a cost of $750,000. The general contractor was Dan Fisher. The addition included upgraded electrical and phone systems, enhanced training space, a laundry room, restroom facilities for firemen with shower decontamination, a generator to use the facility as an emergency shelter, handicapped accessible restrooms for guests, expanded dining room and kitchen with upgraded appliances, new basement storage area, and fire walls. The Building Committee was Paul Fisher, Amy Sweitzer, Diane Glick, Ephraim Stoltzfus, and Sam King with Dan S. Fisher serving as chairperson. The Finance Committee was Allen Miller, Dave Glick, Jake King, Reuben Stoltzfus, and Elam Stoltzfus with Paul Fisher serving as chairperson. Not only did the Fire Company need funds to complete Phase I of the building project, it also needed to replace the squad truck at the same time. The cost of the new squad truck was $194,323. These two major projects together had a total price tag of one million dollars. 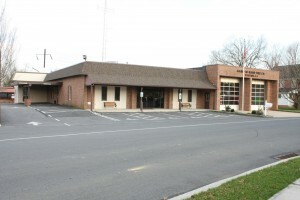 Throughout 2007-08 the Fire Company conducted a vigorous Capital Funds Campaign. The members contacted local businesses and residents and told them of their needs. They also sent literature to their out-of-town friends on their fundraising dinner mailing lists. By combining their Fire Company savings, selling the “House that Hands Built,” accepting the Ladies Auxiliary and East Lampeter Township donations, and with the financial help of many friends, the one million dollar goal was reached. The addition was finished at the end of January 2009. The first fundraising meal served in the new dining room was the potpie dinner on February 21. There are still more areas of improvement at the fire hall that need to be addressed. Phase II of the building project could eventually correct these needs. The most pressing ones are additional office space, a new lobby, and improvements to the parking lot. Phase I was structurally designed to accommodate another addition in the future. The Fire Company is doing careful work on long-term budgets and keeping its future expansion options open.